Without any of the publicity which accompanied its smaller investment in a joint venture with Anil Ambani as part of the Rafale deal, the French firm has paid nearly 40 million euros for a 35% stake in an obscure Reliance company. New Delhi: Even as Dassault Aviation and Anil Ambani’s Reliance group battle allegations that extra-commercial considerations drove their joint venture on Rafale, regulatory filings in France and India reveal that the French defence major followed its JV with an investment in 2017 of approximately 40 million euros in another Anil Ambani venture that is loss making and has almost zero revenues. The investment translated into a Rs 284 crore profit for the Ambani group company, Reliance Infrastructure, which sold shares in a subsidiary, Reliance Airport Developers Limited (RADL) at a premium. It is unclear how the valuation for the RADL stake was reached between the two groups or why Dassault would buy a substantial share in an unlisted company that has little to no revenues and has nothing to do with Dassault’s core business. Public filings by Reliance Infrastructure, a Reliance ADAG group company, show that it sold a 34.7% stake in RADL, a wholly owned subsidiary, to Dassault Aviation in FY 2017-18. The terms of the sale are not known but Reliance said it made a profit of Rs 284.19 crore on the sale of 24,83,923 shares which had a face value of Rs 10 each. Reliance Airport Developers posted losses of Rs 10.35 lakh for the financial year ending March 2017 and earned revenues of Rs 6 lakh. In the year ending March 2016, the firm had no revenues and posted losses of Rs 9 lakh. The company has stakes in a clutch of subsidiaries owned by the group. Most of them are loss making and are airport projects that were awarded by the Maharashtra government in 2009 for Rs 63 crore. A Business Standard report dated October 2015 quoted government officials and ministers saying that due to lack of progress in developing these projects by the company a decision was reached to take back the airports. The company also reportedly wanted to get rid of its stakes in these airports but a news report from January 2017 indicated it had changed its mind. Ironically, while the Maharashtra Airport Development Council (MADC) was prepping to take back charge of the airports due to dissatisfaction with RADL’s progress on the projects, it speedily allotted 289 acres of its land to another group company the same year. Dassault Aviation’s annual report for 2017 mentions the firm’s acquisition of ‘non listed securities’ including a 34.7% equity participation in Reliance Airport Developers. “In 2017, we also strengthened our presence in India through an acquisition of a 35% stake in Reliance Airport Developers Limited, which operates in the management and development of airport infrastructures,” its report said. Oddly, the annual report of Reliance Airports posted on the Reliance Infrastructure site notes that Dassault Aviation now holds 34.79% of ordinary shares but when it comes to describing the terms and rights attached to the equity shares, the details have been blanked out. Screenshot of RADL annual report. 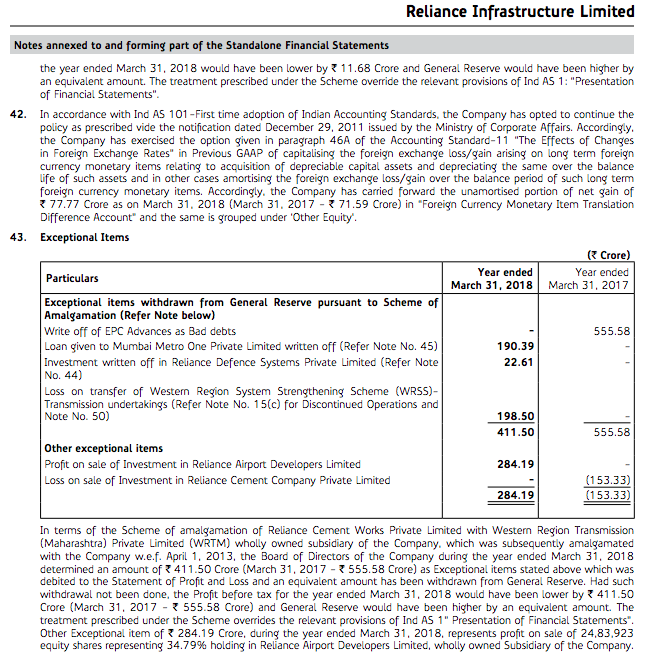 The transaction finds an indirect mention in the Reliance Infrastructure annual report, buried in Note 43 under the exceptional items head, as “profit on sale of investment in Reliance Airport Developers Ltd” of Rs 284.19 crore. In the Dassault report, the net book value of securities in RADL is stated as 39,962,000 euros. 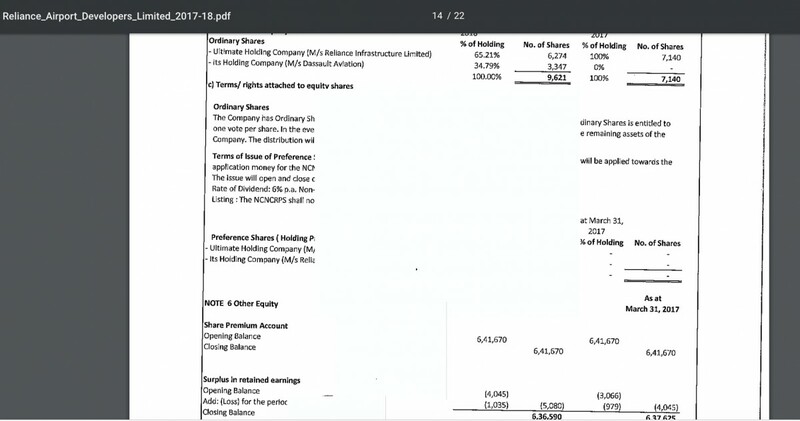 By contrast, the net book value of its securities in DRAL – the joint venture with Reliance for the Rafale – is just 962,000 euros, though presumably it will grow. In a recent interview to the Economic Times, Dassault CEO Eric Trappier said Rs 70 crore had been invested in Dassault Reliance Aerospace Limited, Dassault’s JV with the the Anil Ambani group. Of this only 49% is Dassault’s stake. Filings by Dassault Aviation in France show that besides the Rs 22 crore that Dassault pumped in as equity, it has also given a 4 million euro loan to the JV which roughly converts to Rs 32 crore in Indian rupees. 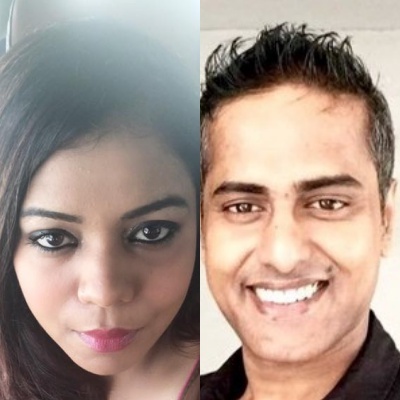 This money, a source in the Anil Ambani group told The Wire off the record, was used by DRAL to pay for its hangar at Mihan. In his interview, Trappier did not mention the money spent for the purchase of a 35% stake in RADL. Prime Minister Narendra Modi announced the Rafale deal on April 10, 2015. In July 2015, Reliance Aerostructure applied to the Maharashtra Airport Development Council for land in its Mihan SEZ in Nagpur. It was allotted 289 acres in August 2015 for Rs 63 crore. The company later said it would take only 104 acres. While the allotment was done in August 2015, Reliance Aerostructure only paid the dues it owed on July 13, 2017, after missing several payment deadlines. Reliance Aerostructure was incorporated on April 24, 2015, days after Modi announced the Rafale deal. It was also given a license to manufacture fighter aircraft by the defence ministry in 2016, which opposition parties allege is in violation of government guidelines. Support journalists who are unafraid to ask tough questions. Just Rs 7 per day from readers like you will keep The Wire going. Click here for more details. Filings for financial year 2017 show that Reliance Aerostructure received an inter-corporate deposit of Rs 89.45 crore from Reliance Infrastructure, the same year that Dassault aviation bought 34.79% of Reliance Infrastructure’s stake in Reliance Airport Developers. From the sequence, it would appear that Reliance Aerostructure used the money received from Reliance Infrastructure to settle its outstanding Rs 38 crore payment with MADC for the land allotted. The dues had been outstanding for more than a year. Filings by Reliance Aerostructure state that the company’s “net worth has been eroded” but was kept as a going concern because of adequate financial support from its promoters. In FY 2017, Reliance Aerostructure posted a loss of Rs 13 crore. The year before that, it posted a loss of Rs 27 crore. In a recent interview to CNBC, Dassault CEO Eric Trappier had claimed his company chose Reliance ADAG as its offsets partner because it had land available next to an airport. However, the land was only given to Reliance by the state government after it had reached an understanding with Dassault to collaborate on the Rafale. According to a Dassault press release, Reliance Aerostructure’s joint venture with Dassault Aviation – Dassault Reliance Aerospace Limited (DRAL) – was formally incorporated in 2017 but goes all the way back to April 2015. The land contribution agreement filed by DRAL with the Registrar of Companies dated July 12, 2018 talks of a sub-lease agreement between Reliance Aerostructure, DRAL and Dassault Aviation. According to this agreement, DRAL, the joint venture partner, would pay Rs 22.8 crore to Reliance as premium for 31 acres of leased property to the joint venture. This debt was converted into “non cash consideration” for 22.8 lakh equity shares of the company. Therefore, the land allotted by the Maharashtra government was used to pay for Reliance’s equity stake in the joint venture company. Dassault aviation gave Rs 21.09 crore cash for its equity stake in the firm. The Wire has contacted Dassault and Reliance ADAG seeking greater clarity about the land transaction and Dassault’s wider dealings with the Reliance ADAG group, including the valuation of its investment in Reliance Airport Developers Ltd. The story will be be updated with their responses when received. Update: In a press release issued more than 24 hours after The Wire’s story appeared, Reliance ADAG Dassault’s investment in Reliance Airport Developers Limited has “no link whatsoever” with the Rafale deal. The full text of the Reliance group’s statement responding to the Congress press conference is available here. Note: In an initial version of this article, the euro figure corresponding to RADL’s stated profit of Rs 284 crore was mistakenly stated as 4 million at the prevailing exchange rates in 2017. It is actually 40 million.